A class with Miss Zoe features exposure to yoga poses and stretches, playful movement games and breathing exercises. 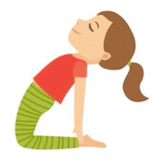 Miss Zoe makes yoga approachable and fun while still emphasizing focus and attention. Each class is 45 minutes long. We welcome all children ages 3-6 so come on over, drop your little ones off and see what we’re all about. We’ll even provide the mats! Although we know many children in the area have already experienced a yoga class with Miss Zoe and loved it, treat your first class as a trial and take 50% off by entering promo code yoga50 when you check out (or click here)! ﻿Zoe Anthony is an experienced Kindergarten teacher from Hoboken, NJ. 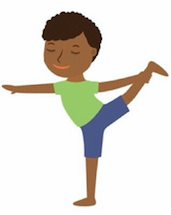 She has incorporated yoga and movement exercises in her Kindergarten and Pre-K classes with the goal of increasing her student's physical awareness and mindfulness. After 4 years of success, and lots of encouragement from parents, Miss Zoe is now offering her class to children outside of her classroom! Please register in advance to reserve your child's spot.